All businesses have a duty of care for their staff, visitors and contractors entering their building. 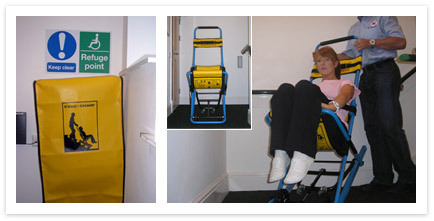 Installing an Evacuation Chair in a building and having trained personnel in its use, ensures people who would normally use an elevator to enter or exit a building, also have a means of escape in a Fire situation. Designed to enable the employer to deal with the evacuation of non ambulant persons from their building in the event of an emergency. It is no longer deemed ‘reasonable’ to leave anyone in a refuge area on an upper floor, whilst the building burns around them. The Evacuation Chair Training course is tailor made to the specific risk, delivered by expert staff with over 30 years Fire Service experience.